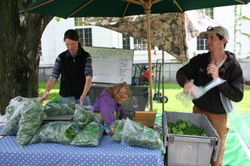 Seven Days Blogs: Omnivore: Farmers' Market Season Has Begun! Farmers' Market Season Has Begun! Where in Vermont can you find sizzling burgers made with grass-fed beef, Tibetan momos, pork tamales, egg rolls and barbecued meats with Caribbean sauces, all in one place? Nope, it's not an International food court or an "eclectic" restaurant: Every one of these items is available at the Burlington Farmers' Market, which kicked off the season last Saturday with gorgeous weather and a big, hungry crowd. I had a great time wandering City Hall Park and reconnecting with a few vendors I hadn't seen for a long time. Although I didn't buy too much (my farm share takes care of most of my veggie needs), I did get some cave-aged "Butternut" cheese from Willow Hill Farm as well as some Caprella (you can never have too much cheese) and pork chops from Doe's Leap. And I got some ground beef from Stony Pond Farm, too. Although there weren't many veggies available yet (some overwintered roots, microgreens and tons of spinach), the most exciting part about the first few markets is that there's something new every single time. I may have to miss this coming weekend though...I'll be handing out the 7 Nights Dining Guide at the Vermont Chocolate Show in Essex, as well as sampling the delightful chocolate martinis. Very excited that farmer market season is back. I have a slightly off-topic question is there a good fishmonger in Vermont? Getting fillets is relatively easy but I'd like to get fish with bones and stuff so I can make stock and make French fish soup. A good fishmonger seems to be the only thing missing from Vermont but maybe I'm not looking the right place. LATENAC: I've heard good things about the Earth & Sea fish market in Manchester, VT. I realize this may not be the most practical answer to your question since I'm assuming you live in the Burlington area. Manchester is about a 2, 2.5 hour drive south from Burlington.